Pega® Robotic Automation build 8.0.1089 and later include a scheduling service that you can use to schedule Robotic Processing Automation (RPA) sessions. With the Pega RPA Service, you can log in to a virtual machine as a Windows user and start or stop Pega Robotic Automation Runtime. You can also specify daily schedules for a Runtime robot to better manage production systems whose applications are not available at all times. The SchedulerDefinitions.xml file includes the information that is required to handle Windows 7 and Windows Server 2012 login pathways. If you use other operating systems, use this file to define the sequence of login screens that those operating systems display and the actions that the system must take to start the virtual machine. When you first install build 8.0.1089 or later, the Setup wizard copies the SchedulerDefinitions.xml file into the \programdata folder and the Studio/Runtime \installation folder. The Pega RPA Service uses the SchedulerDefinitions.xml file that is located in the \programdata folder. The version of the SchedulerDefinitions.xml file that is located in the Studio/Runtime installation folder serves as a template. If you later update the system with a newer build, the system checks to see if there is a SchedulerDefinitions.xml file in the \programdata folder. If there is, the installer does not replace this file. Any changes that you have made to this file remain available. The SchedulerDefinitions.xml file includes entries, or matchsets, for Windows 7 and Server 2012 login sessions. The Pega RPA Service determines which matchset to use based on the operating system of the computer or virtual machine on which the robot is running. If a machine is not logged in and the robot is scheduled to run, the Pega RPA Service reads the appropriate matchset from the SchedulerDefinitions.xml file. The Pega RPA Service searches for the screens and controls that display based on the order in which the matchsets are listed in the SchedulerDefinitions.xml file. The RPA Service checks for the disclaimer screen. If there is no OK button, the Pega RPA Service stops the login attempt because the matchFailure key is set to stop. If there is an OK button, the Pega RPA Service clicks the button and continues to the next section. The RPA Service checks to see if the Username and Password fields exist. If the Username and Password fields are available, the Pega RPA Service enters the password that it retrieved from the Pega Credentials Manager, then clicks the OK button and stops. If the user name and password do not match, the Pega RPA Service moves to the next matchset, and so on. By default, the SchedulerDefinitions.xml file only supports domain logins. It does not support local account logins. The installer also installs the SchedulerDefinitions-Local.xml file in the Studio/Runtime installation folder. If you need to support local account logins, such as for testing purposes in a production environment, copy this file into the \programdata folder and rename it to SchedulerDefinitions.xml. Alternatively, you can cut and paste the applicable sections from this file into the SchedulerDefinitions.xml file. To add a matchset and define the actions that the system performed during the login sequence, review the WinLogon.Scheduler.log file. Use the Accessibility log entries in this file to determine which controls display on the various screens. Where the logon engine found the OK button on the disclaimer screen and clicked it. The next screen that contains the username stsosdomain1\Administrator and a blank password. Where the logon engine finds the user’s static text (stsosdomain1\Administrator), the Password control, and where it processes the action for the password control (supplying the password from the Pega Credentials Manager). The logon engine then clicks the OK button. 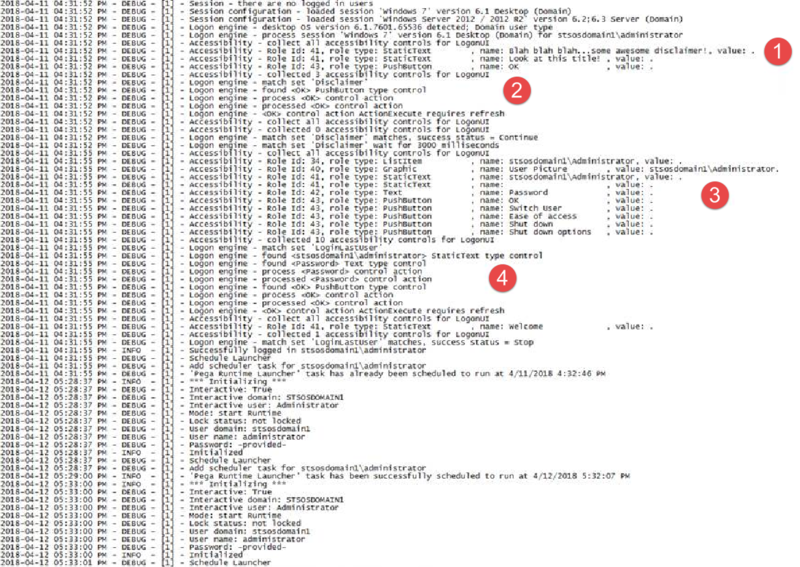 Review the log file to see which screens display during a logon sequence and to determine how to modify the SchedulerDefinitions.xml file to handle these screens.